Welcome to the Young Voices Choir page. I am Mrs Hartley and would like to tell you a little about our choir. We meet every Tuesday in the year 5 classroom from 3.30 - 4.30 where the children (and adults) practise the songs and dance moves ready to perform in the arena on concert day. On the day of the concert we leave school after lunch and travel to Manchester by coach (which is provided by Friends of Ashleigh). 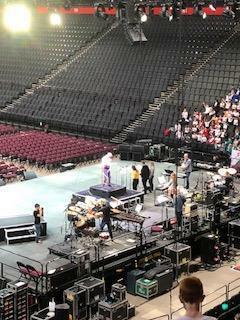 Once at the arena it's rehearsal time with 6500 other children and our guest stars before breaking for tea. We had an amazing time last night at the Manchester Arena. Thank you to all the parents who attended, I hope you enjoyed it as much as we did. We will be registering for YV 2020 so rehearsals will begin again in September. We have registered for the concert in 2019. The date we will be attending is Tuesday 12th February 2019. We will start rehearsals on Tuesday 11th or Tuesday 18th September 2018, these will take place in the hall straight after school and finish at 4:30. Please collect your children from the reception class gates. 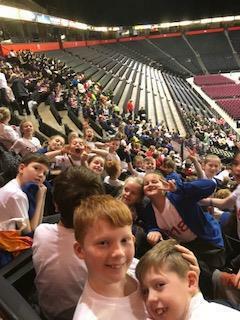 We had an amazing time at the Manchester Arena, the children were a real credit to our school and to their parents. Below are a few photographs from the night. Roll on next year. I know some of you will have concerns about us performing at the Manchester Arena in light of what happened there earlier this year. I received this letter from Young Voices and thought I would share it with you. Rehearsals for Young Voices 2018 will begin on TUESDAY 19th SEPTEMBER in the school hall. Practice will be from 3.30 - 4.30. Please collect your child from the ramp by the kitchen. Below is the link to the lyrics we will be performing at the 2018 concert on Thursday 25th January. Please encourage your child to learn these. The children will also be bringing home a lyric sheet. Please keep these at home for the children to practise from. The children will need to know the lyrics as they are not allowed to take them to the concert. I have received news that the new song pack for 2018 will be here before we finish for summer. The countdown has begun. Just to let you know. 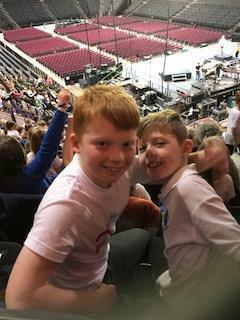 We have registered for Young Voices 2018. It appears that our concert will be on Thursday 25th January 2018. I am so proud of all the children. They performed brilliantly at the concert and they all seemed to have a fabulous time. I have registered our interest for the next concert so roll on June when I will get the 2018 music pack. Thank you to all the parents for your continued support it is appreciated. The children are working hard to learn the songs. We only have 11 practices left before the concert, (allowing for the Christmas break and we will not be practicing on 6th, 13th &20th December), so can you please encourage your fantastic singers to learn all the words. We will be learning the actions to the songs during rehearsals and you can practice at home by following the links below. The children are doing really well learning all the songs and dance moves. Today (29th November) will be our last rehearsal befor Christmas, we will begin again on 10th January. It's arrived!! The new pack is a great mix of rock, pop and folk music, there's lots to get our teeth into. Rehearsals start again in September. What can I say. The concert on Wednesday was amazing all the children were a credit to our school. They sang their hearts out. Thank you to the parents for their support. I will post photographs later this week. I thought I'd share some photographs from last year's concert.